I believe that mobile have reached a point of stability. I may be completely wrong and a magical phone might appear somewhere which can cook tasty meals, take your kids to school and maybe fulfill a wish or two. In my opinion though, the next advancements in the mobile arena will be of three kinds. 1. Incremental in performance – The PC stopped changing the year Apple 2 came into existence. After that every computer that has been made is just an incremental over the older technology. The processors became faster, the RAM increased and the graphics improved. Yet, nothing changed out of the ordinary. Here I am defining PC as the CPU, Mouse and Keyboard. The huge change came in TV- LCD from CRT. That gave way for the laptops and later mobiles. But that wasn’t a change in PC, mind you. Similarly, once iPhone and Android changed the mobile arena everything has been incremental in nature and now with almost the end of screen size is reached – this will continue for processors and RAM just like the PC. 2. Incremental in Software – With great hardware comes great software. With Google Now getting appreciation for itself and new technologies coming for Android and companies like Microsoft and Blackberry getting their problems in order, software is going to be the key differentiation and thus improvements in this department will be seen definitely. 3. An old technology phoenixing itself and supporting mobile with it– This is what a transformation in TV arena did for PC. Even now, the television is constantly evolving from being an idiot box to a Smart TV. I would like to discuss the third one in a better light though. TV is almost a connected device to the Mobile and PC world. We can already use a HDMI cable to connect the PC with Screen or even use WiFi to transfer a video from the phone or a tablet to a TV. Thus, while TV, camera, tablet, mobile and PC are holding hands together there are a plethora of machines that are out of the story. Cars for example are getting sophisticated every day and yet we can’t connect our phone to the car and listen to music in our phone in the car without stopping the music play. It is still not possible that your car can remind you that you are supposed to go somewhere today at such and such time. Just one look at the house-hold and one can see opportunities lurking around everywhere. Be it the refrigerator in which we can’t set the temperature remotely. Or know what all content we have in the fridge. A small camera scanner can do that. Imagine shopping in a grocery store and just open your phone to check what is in your fridge. Why can’t my geyser have a clock that matches my alarm? As my alarm buzzes, it automatically starts eating the water and stops when I go out. Now, all these technological advancements are not only possible but probably there are some homes where this is happening to a certain extent. The prohibitive factor right now is price. And most of the time, the true advancement is not creating a technology but making it available to masses. So, in my opinion the next big thing in technology won’t be a mobile or a PC or a Laptop. It would be one of those. Google is already working on a driverless car. Other technologies need a push too. They have gone stagnant. What is your opinion? 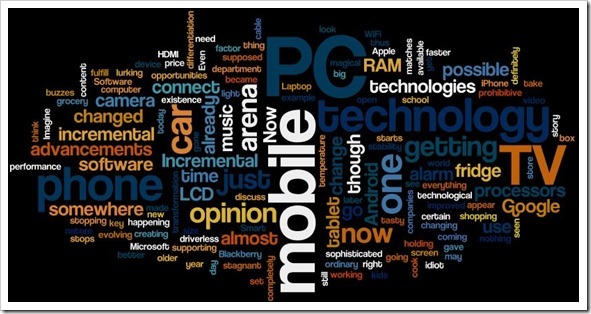 Which technology you think will have the same impact on mobile as LCD had on PCs?